You are here: Home / Home & Family / Oh what a night! I knew posting that picture of E in his big boy bed would somehow jinx us. I had just fallen asleep and what do I hear? My name. Not being called out quietly. Oh no, that would have been too easy. Instead, we were screaming out as if someone or something was hurting us. The hubster being the oh so loving and caring husband that he is tried to go in to comfort E and get him back to sleep. But that wasn’t good enough. Oh no, he needed his mommy. And he let everyone know about it. I gave up and went in. He immediately wanted me to hold him. He was sobbing and shaking. What on earth happened? I still don’t know. He somehow conned his way into our bed. I knew we were in for a long night. First, he wanted to play. Then, he was crying to watch a show. Then he was screaming that his ear hurt. Well, that would make sense right? That’s what woke him up. I thought that then, but now I’m convinced it was all an act. Finally, he settled down and passed out in between us. As both of my boys were sleeping, snoring in tandem, it reminded me about E’s early weeks when we co-slept. Pretty soon I would have another little man to share my bed with. Another little snuggle bug to take up half the bed. And I just know that there will be some nights that E will want in on the action as well. We’re going to need a bigger bed. 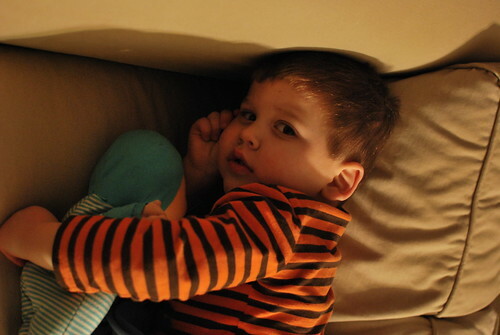 I loved bringing J in my bed when he was an infant. He would wake up around 5 to eat, then we'd go back to sleep until 8 or 9. Obviously, it will never be like that again because with #2 I'll have to get up with J! He will not sleep in our bed. If we bring him in when he wakes up crying, he just wants to play and cuddle. But he wants no parts of sleeping. Pie loves being in bed with us, but thinks the same thing…play time! I keep trying to convince Dave that we need a king sized bed… it's the only way we're going to get any sleep when baby #2 arrives. Thankfully most of the time Finn is in his own bed, but those nights that he isn't are awful.